Ulmo Honey for sale. Buy online at Zingerman's Mail Order. Gourmet Gifts. Food Gifts. Like so many of my favorite honeys, Ulmo is very thick, almost luxurious. It’s spreadable yet crystalline, with an aroma like a bouquet of violets – hard to place and fleeting. The flavor is minty and spicy, without a hint of bitterness. If this sounds like there’s a lot going on in this honey, you’re right. It’s interesting stuff. 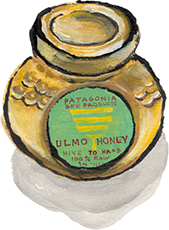 The hives for the honey are placed when bees are seeking pollen near Ulmo trees, evergreens unique to Chile that grow upward of a hundred feet. It’s excellent over biscuits, in oatmeal, spooned into tea, or with a fresh City Goat Cheese from Zingerman’s Creamery. Or–this might sound strange–mix some with olive oil on a plate and drag a chunk of Paesano bread through it. You'll be suprised at how delicious a habit you just formed.